Asteroid Ryugu, photographed by Japan's Hayabusa2 spacecraft on June 23, 2018, from a distance of 25 miles (40 kilometers). "As we approached Ryugu and were able to distinguish individual features in the asteroid's topology, it became clear that Ryugu has a land of rich terrain," mission principal investigator Seiji Sugita said in a different statement published Friday (June 21). "Numerous clusters of rock roll on the surface. Among these, a large rocky mass (about 150 meters [490 feet] across) stands out on the upper part of Ryugu due to its brighter color (higher reflectivity). The belt-shaped ring of peaks that surround the equator are also slightly brighter than their surroundings. "This color difference," Sugita added, "may reflect a difference in material composition and the size of the particles that form the rock. We can also see many sunken regions that look like craters. These depressions may have been made in collisions with other celestial bodies. A structure that looks like a grove is also visible." JAXA has released a number of Hayabusa2's Ryugu photos in recent days. For example, another set showed that the asteroid rotates perpendicular to its orbit every 7.5 hours. Ryugu also appears to be similar in shape to asteroid Bennu, the target of NASA's OSIRIS-REx asteroid-sampling mission, and asteroid 2008 EV5, the target of the proposed European MarcoPolo-R mission that ultimately was not selected for launch. Such operations will be complicated somewhat by Ryugu's distinctive shape, as Tsuda mentioned in his reference to "engineering challenges." 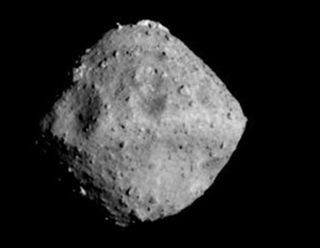 That shape "means we expect the direction of the gravitational force on the wide areas of the asteroid surface to not point directly down," Tsuda said. "We therefore need a detailed investigation of these properties to formulate our future operation plans." Hayabusa2 is following in the footsteps of the original Hayabusa mission, which made history in 2010 when it returned small pieces of the asteroid Itokawa to Earth.